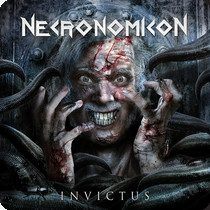 Necronomicon are a band from Germany that started out playing black/thrash metal but have evolved more into a thrash band with a power metal edge and this is a review of their 2012 album "Invictus" which was released by Massacre Records. Drums range from slow, mid paced to fast drumming with some blast beats being thrown in at times, while the bass playing has a very strong and powerful sound with riffs that dominate throughout the recording. Rhythm guitars range from slow, mid paced to fast thrash/speed/power metal riffs that do not have the black metal influence of the early albums except for the re recorded and live tracks in addition there is a brief use of soft and clean playing being used on a few songs, while the lead guitars are very meldoic sounding 80's metal guitar solos and leads, as for the acoustic guitars when they are utilized they use full chords to bring a classic rock felling to the music. Vocals are a mixture of thrash style growls and rough style power metal clean singing with some samples being thrown in at times as well as spoken word parts, while the lyrics cover dark themes, as for the production it has a very strong, powerful and professional sound to it and the bonus tracks where recorded live. In my opinion while I prefer the older material from Necronomicon and have only heard the first 2 albums they style play a decent form of power/thrash and if you are a fan of this style, you should check out this album. RECOMMENDED TRACKS INCLUDE "Unleashed" "Upon Black Wings" "Possessed By Evil" and "Magic Forest". RECOMMENDED BUY. 1. Can you tell us a little bit about your solo project and how it is different than the work in your other projects? When I first started, my solo work and Dethcentrik were the same. Dethcentrik went on hiatus and I was unsure if the project would continue. I ended up creating 3 Dethcentrik EPs by myself actually before the release of my first solo album. The following Dethcentrik had gained kept it afloat during the hiatus, and I was able to get some help from my good friend Jackie T, and re-form Dethcentrik. Slowly the two projects began to separate, and Dethcentrik is more rock at this point in time, and my solo material has become more industrial. I would call what you heard industrial, or just art music. I even took an approach typical of classical: expression through only instrumentation. 3. What are some of the themes and concepts you bring out in the music? The state of the United States, and the world. Mental illness. 4. What was the decision behind doing a solo project? Originally, when I thought Dethcentrik was broken up for good, I wanted to continue music on my own, and my solo work began. One song of mine "Why Won't You Die?" was originally recorded by me as Dethcentrik, but it was released on my solo album. My first solo album was actually released as Dethcentrik and under my solo name, and many of the songs had previously been released as Dethcentrik. The only two songs that I did not entirely write, compose, and record of Dethcentrik's pre-Why the Innocent Die Young material were Life Down the Toilet and Morderisk Depresjon, other than the live material that is, and there was only one show; it just happened to be performed well enough to record. For the longest time Dethcentrik and I were one and the same anyway. 5. When I listened to the music you had a very harsh noise sound a style that I have not heard much of since brighter Death Now and Merzbow, how would you say the noise scene has evolved over the years? I would say noise is more of an art-based genre. Less about the popularity and more about the expression. I think over time that mentality has actually increased, and it has more prestige than it used to. 6. On a worldwide level how has your solo project been received by fans of underground music? Same as Dethcentrik really: mixed reception; loved or hated, nothing between really. 7. What direction do you see this project heading into during the future? More classical influence. I actually compose on my own, but I'm very much more reluctant to share it as publicly as I am other works of mine. Perhaps on future releases I will be less reluctant the share those types of works. 8. Colorado is known for having a metal scene but how would you describe the noise scene in this state? I would say it's non-existent. Have to reach out internationally for support. 9. What are some bands or musical styles that have influenced the music that is on the solo project? Industrial, classical, jazz, and other forms of electronica on the whole. I would like to thank you very much for your support, and for this interview! Dod Berverte is a musician from Colorado Springs, Colorado also known for his work in Dethcentrik and with his solo release he goes for more of a dark harsh noise/experimental/power electronics/death industrial sound and this is a review of his self released 2012 album "Dawn Of New Tryanny". Drum programming are all slow militant industrial beats, while the noise effects sound very harsh and brutal sounding, as for the synths when they are utilized they bring a very evil and dark ambient/experimental sound to the music. Vocals as well as traditional instruments are absent from this recording, while the song themes cover the fucked up side of the world, as for the production it has a very dark, raw and primitive sound to it. 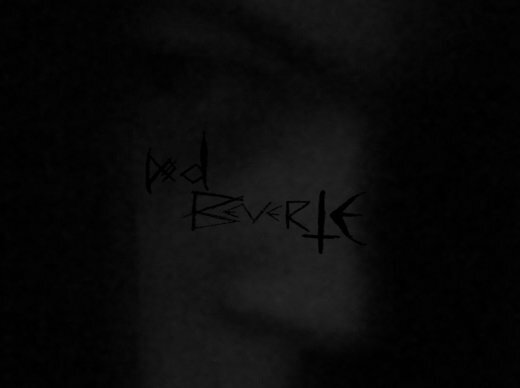 In my opinion Dod Berverte are a very good harsh noise/experimental/harsh electronics/death industrial project and if you are a fan of this style, you should check out this album. RECOMMENDED TRACKS INCLUDE "The Voices" and "Earth Accepts Her Fate". RECOMMENDED BUY. 1. Can you tell us a little bit about the project for those that have never heard of you before ? There is not much to say as the project is very recent. I composed for a few years and a day I decided to release a split with a spanish black-metal band, friend of mine, Atrabilis. The track figuring on this CD was quite old but not released until early 2011. A few months later, my first album Paysage. Octobre. was thus completed and recorded. I released it almost immediately, in October 2011, and I'm glad to see that it was well received in France. Echancrure is a mean to experiment; I'm not trying to make music in this or that style. For sure, I'm not doing black-metal anymore. The next record to be published - in February - is a rap record ! a remix of an entire album from the French artists Iris & Arm. I had only the voices a capella, and I made the music. I don't want Echancrure to be rooted in a particular genre, emotion, ambiance, concept, etc. I want it to change from one record to another; a bit like Ulver did; but keeping a kind of essence, feeling, a representation of music that would be mine. 3. What are some of the concepts and subjects the band explores with the music ? On Paysage. Octobre., texts and vocals were not that important; the most important was the atmosphere. But the next EP to be released in May is a musical interpretation of Césaire's Discourse on Colonialism, an anticolonial pamphlet. Echancrure simply means notch. I thought it sounded good. 5. Currently you are unsigned are you looking for a label and if so what kind of label do you feel would be a perfect fit for the band? I'm actually signed on Nihil Interit Records, a sub-label of Le Crépuscule du soir. I think it fits perfectly, because their "main goal is to release underground music, mostly dark, original..." Moreover, their prices are fair (around 7-10 €) and they're open to free download. But if I had to chose a greater label, I would chose Avant Garde Music. 6. Are there any other projects besides this band or is this a full time project ? Yes ! I have a lot of projects. Echancrure and Galvauder (http://galvauder.bandcamp.com/) only are the tip of the iceberg. Many albums are already recorded and just waiting to be released. 7. What direction do you see your music heading into on future releases? I do not know. I'll probably get more and more closer to contemporary classical music and jazz, two of my biggest influences. Paysage 2 is half written and recorded, and even if the atmosphere is similar to Paysage. Octobre. 's, a lot of new instruments and sounds have been added. I don't care about genres, and I like all that's unusual. Everything I listen to, everything I live, read or see is an influence. Talking about music, I'm listening a lot these days to the excellent Kayo Dot's Gamme Knife, Shostakovich's quartets, Al Kaïra Krew, Olivier Messiaen, Pat Metheny, Serge Teyssot-Gay, Heltah Skeltah, The Ex, etc. 9. On a worldwide level how has your music been recieved by fans of experimental, ambient and underground music? 10. Does Occultism play any role in the music? Some of my interests are philosophy, literature, and girls. Thank you very much ! I apologize for my bad english.